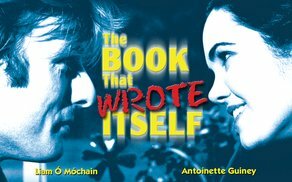 Liam O Mochain’s debut feature film 'The Book That Wrote Itself' (1999) has been picked up by US distributor Janson Media for worldwide rights (excluding UK/Ireland TV). The film is now available to buy/rent on Amazon TVOD in North America, UK/Ireland and available to view worldwide on Amazon Prime SVOD. ‘The Book That Wrote itself’ screened at many international film festivals including Vancouver Int. Film Festival in Canada; Seattle and Boston in US; London, Cambridge and Raindance in the UK; Oslo in Norway; Mar del Plata in Argentina; Durban in South Africa and Galway film fleadh (World Premiere) in Ireland. The film picked up three international awards, including the Critics Prize at the Austin Film Festival. “We are delighted that the film is getting an opportunity to be seen by a new audience worldwide with a really great distributor. Janson Media are well known and trusted in the industry and have been handling films from all over the world including Ireland for the past 30 years”. The film is narrated by Michael D. Higgins. 'The Book That Wrote Itself' is about Vincent Macken (O Mochain) who has written what he thinks is the best novel ever, a Celtic quest saga set in Ireland 200 years ago. When he overhears literary agents at a book fair ridiculing his masterpiece, he vows to prove his detractors wrong. He hires Aisling (Antoinette Guiney) an aspiring filmmaker, to document his novel on video. Soon the novel takes on a life of its own, as she is more interested in making a documentary about him. Vincent finally decides that what he has created has the potential for a hit movie. He goes to the Venice film festival, blags a press pass and tries to convince Hollywood stars to come to Ireland to take part in his forthcoming movie. The result is not what he expected. The film was released in Ireland in 2000, the UK in 2001, in North America, Australia, New Zealand, Singapore, Japan, Thailand, Malaysia, S. Korea & Hungary in 2003. The film was re-released in the Ireland/UK on DVD in 2010 by Media sales/Sony for its 10 year anniversary. The film was produced by Siar A Rachas Muid Productions Ltd (‘WC’) with completion funding by the Irish Film Board (now Screen Ireland). ‘Lost & Found’ Liam O Mochain’s 3rd feature film is out in UK cinemas on Oct 19th.